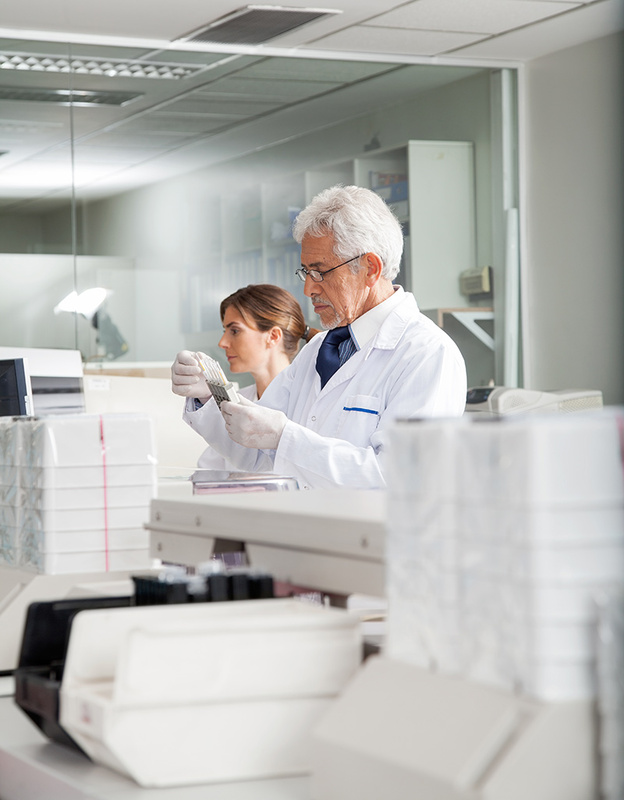 Many tests are carried out during manufacturing or as final inspections. Many of them are attended by customers or third part inspectors. You can find here the main tests concerning the behaviour of cables under fire conditions. 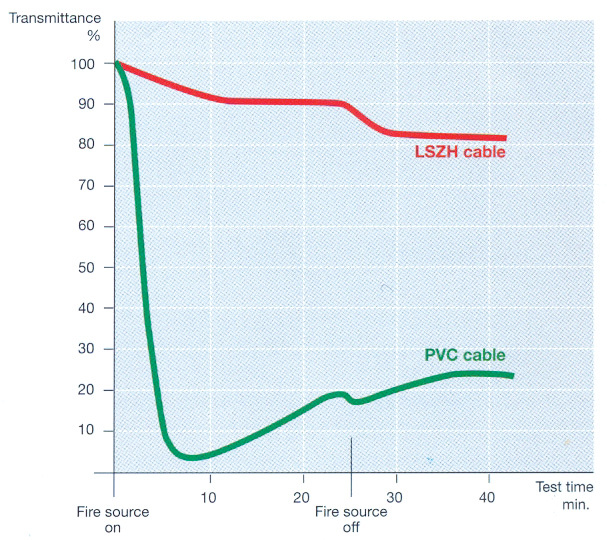 Specification for 300/500 V fire resistant screened cables having low emission of smoke and corrosive gases when affected by fire. Multicore and multipair cables. This standard includes the currently most common cable onto the market of the fire resistant cables. Those cables are used in fire alarm and emergency lighting applications. They have a rated voltage of 300/500 V.
Generally, the cables are particularly flexible and easy to be installed. These standards require that the cables get through the fire resistance tests prescribed by BS 6387 standards. Thermosetting insulated, armoured, fire-resistant cables of rated voltage 600/1000V, having low emission of smoke and corrosive gases when affected by fire. This Standard refers to the armoured cables with rated volt- age 600/1000 V.
The circuit integrity performance under fire conditions is assessed on the basis of various tests which either separately measure resistance to fire, resistance to fire with water, and resistance to fire with mechanical shock, or in combination measure resistance to fire with mechanical shock and water. Their terminations with a rated voltage not exceeding 750 V Cables. These standards apply to mineral insulated cables. Those cables have an insulation completely different from those seen so far: they are extremely resistant but rigid. Their installation is not handy and a particular care has to be paid to the installation, to prevent moisture absorption by the mineral oxide. This test is carried out to verify the circuit integrity of cables exposed to fire at 830oC and mechanical shocks. This test is carried out to verify circuit integrity during a fire. 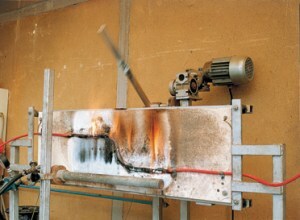 The cable is exposed to a flame at 830°C and mechanical shocks for 15 minutes and additional 15 minutes to flame, mechanical shocks and water spray. This test is carried out to verify circuit integrity during a fire. The cable is exposed to a flame at 930°C and mechanical shocks for 60 minutes and additional 60 minutes to flame, mechanical shocks and water spray. Following tests are carried out to verify if a cable is capable of maintaining circuit integrity under fire condition, fire with water, and fire with mechanical shocks. During the tests the cables are maintained at their rated voltage. The cable is exposed to fire at the specified temperature and time. 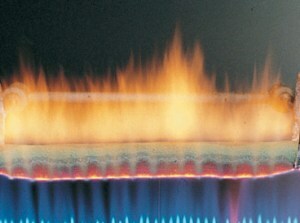 The cable is mounted on a vertical panel and shocked with a steel bar for 15 minutes while submitted to the action of a flame. See our Fire Performance Video Library. 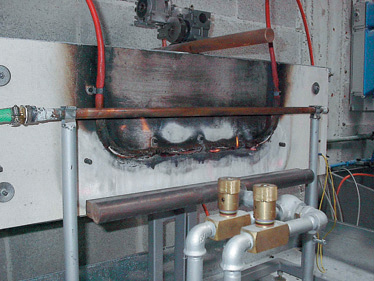 This test is carried out to verify circuit integrity even during a fire. A sample of cable is held on a flame at about 750°C for a period of minimum 90 min, under rated voltage. No break or short circuit should occur. 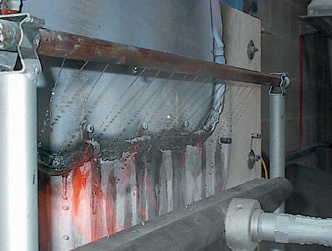 The test can also be performed in more severe conditions, up to 1100°C. Fibre optic cables can be tested in same conditions, monitoring the attenuation of the signal of one or more fibres. Samples of cables 3.5 m long in quantities required by standard are installed on a ladder inside a metallic cabinet. They are subjected to the action of a flame at 750°C for a specific time (20 or 40 minutes). Cables must not burn for more than 2.5m. A 60 cm long sample of cable is vertically fixed with two clamps inside a small cabin, open on the front. The cable is subjected to the action of a flame produced by a calibrated Bunsen burner. 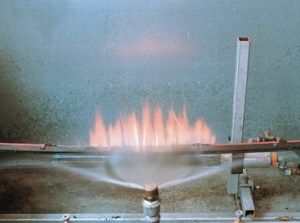 The application time of the flame is according to the cable diame- ter (60-480 seconds). At the end of the test the burnt portion of cable must not be 50 mm close to the higher clamp. 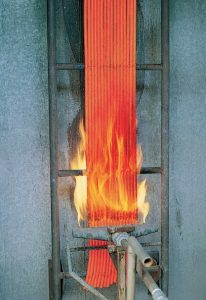 Each non metallic material of the cable (-1.0g) is burnt into a tube furnace up to 800°C. A controlled air flow rate absorbs the generated gases in an appropriate solution. 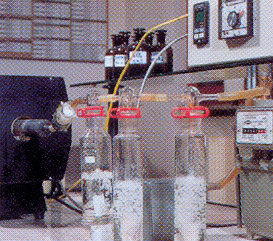 The tritation of the solution allows to determine the developed hydrochloric acid (HCI) amount. 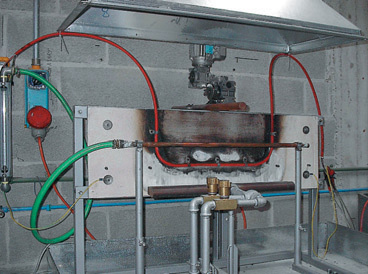 This test allows estimation of corrosiveness against metals of gases released when cables burn. Materials composing the cable are burnt into a tubular oven with a temperature higher than 935°C. A controlled air flow rate absorbs the generated gases in a specific distilled water solution. pH and conductivity are finally measured. the mid vertical plane of the cube, at height of 2.15 m. Absorbance or light transmission are measured.